I have always got a list of jobs i would like to do next and try and tick them off at a rate of one or two a year. Last year was oil leaks and rustproofing but its probably a sign of "getting there" that the first job this year was purely cosmetic. Stunning job mate, impressed ! Nice reference guide to cleaning products used on the various bits though - especially the exhaust which I just tend to use a bit of WD40 on. How do they know how thin the paint is ? and is yours original paint ? Nice job, the snow foam picture looks good, they did a pre-wash or cleanse before the hand wash.
Steve, there is a device that these people use to measure the thickness of the paint and then they can determine how hard or vigorous they can polish the paintwork, no idea what depth is normal, unless someone here knows? Just my hand, above the wrist. Looks fantastic Andy , have a good show at the weekend. Don't think we'll make it this year. I think you have had coil over suspension fitted since we last spoke how do you find it compared to standard ? What's the ride like etc ? I still have a brand new pair of rear dampers safely tucked away in the loft but the day will pobably come when the change will have to be made. Steve , just had a quick look at my car and standing still , engine off it reads 12mph and 500 revs ! I always said it looked like it was moving whilst standing still . I think Andy's car reads in kmph. bonnet appearance no end. Walkers also told me never to steam clean the engine bay. Steve P - they spot clean engine components by brushing on a cleaner, wiping it down and then dressing it to make it look shiny. I guess they must use some water but they were really keen to point out they would only do what was safe. In terms of paint the orginal bits are bonnet, roof and doors and rear quarter panels and one wing. This was where it was thin. Bumpers, tailgate, windscreen scuttle, cills and and one wing have all been painted over the last 5 years. As Neil says they go round the car with a paint thickness guage and this determines how aggressive they can be. In this case the answer was "not very"
Steve G - yes after a lot of consideration I thought I would try some coilovers. These are the RSR ones. At first i thought I had made a huge mistake as they weren't set up correctly but after replacing the drop links, a worn gearbox mount and rear track adjusters I got it properly aligned and am now pleased. The stability in high speed corners is superb and there is far less roll and it also feels like it will have dialed out alot of understeer. Don't believe the ride is vastly improved and it pogos a little at speed which i think is common with firmly sprung short wheelbase cars. I will keep a set of originals in the loft! I am going to show this to the Cubs when bob-a-job week comes around. Ben, you are a hard man !!!!!!!!!! 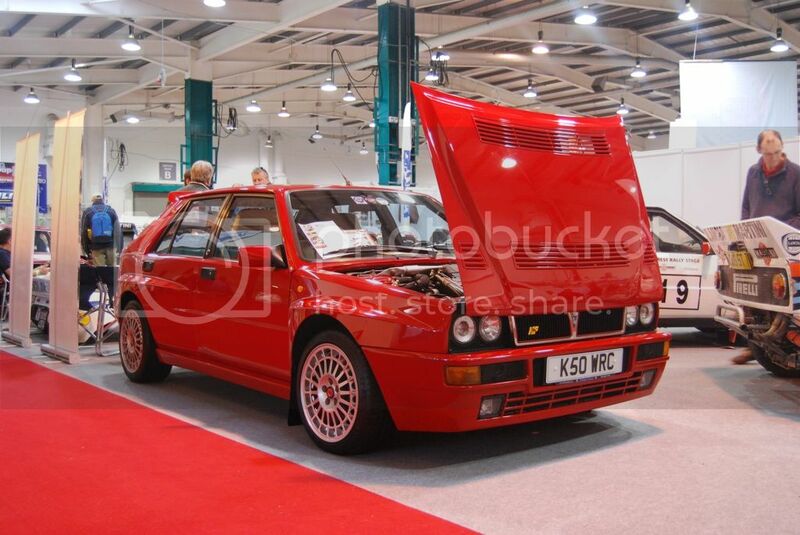 maybe we should all book in before silverstone, it would be like the lancia production line running again. ... and I noticed the coilovers and was going to ask the same question as Steve G - not that I want to change. Looks great under the lights. Makes me want to decorate and carpet my garage!! !